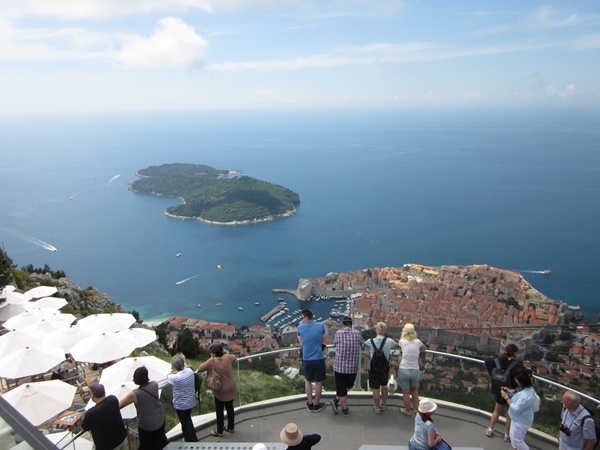 Once your are in Dubrovnik you should definitely take a Cable car ride to the top of Mount Srdj above the city. From there you can enjoy the amazing views of the whole city, surrounding islands and the Adriatic Sea. Cable car ride is a short and in only 3 minutes you will be at the top of the Srdj. While there you can visit Homeland War Museum in the Fort Imperial to learn more about recent Dubrovnik's history. There are Panorama Bar & Restaurant if you wish to have a drink or dine while enjoying amazing views of the area. If you are after some fun you can take a buggy ride and explore hidden corners of the nearby countryside. It is very easy to reach Dubrovnik Cable car from Old Town or Pile or Ploce Gates. From both gates you can reach it by walking around the city walls. There are pedestrian sidewalks which are not very steep and it is quite easy to walk towards cable car (8-10 minutes. From Old Town you can do this by walking up the stairs from Stradun by taking Boskoviceva street. When you reach the top of the street you need to walk across parking lot towards stairs below cable car. For visitors arriving from cruise port the easiest way to reach the Cable car is to take city bus no.8 which will drop you exactly at the spot or take a taxi from the port. Cable car round-trip ticket costs 170 Croatian kuna for adult or for 60 Croatian kuna for children (4-12). One-way ticket costs 90 Croatian kuna for adult or 40 Croatian kuna for children (4-12). For children up to 4 years the ride is free. Tickets can be bought from the receptions of the many hotels in Dubrovnik, from several travel agencies in the city, at the Cable car stations (can be paid in kuna or by credit card) or online. There is also an option of buying Cable car tickets online via Viator or Getyourguide . This way you will skip waiting in long queues in front of the Cable car. Upon booking you will receive the voucher that you need to present ti to the staff who will exchange it for the Cable car ticket.